Unfortunately, when your car breaks down, the hassle is not just limited to waiting for the recovery truck to arrive. Follow-up repairs are often necessary meaning more time and expense, and if the car cannot be fixed straight away, you'll need to find alternative transport. But they can be avoided with a FREE Vehicle Health Check from ATS Euromaster. The FREE Vehicle Health Check from ATS Euromaster takes around 30 minutes and can be booked at any of our servicing centres. Whilst breakdown assistance can cover the costs and inconvenience arising from a breakdown, prevention is better than cure. We appreciate that not everyone is able to check their vehicle as often as they would like. But a large number of all breakdowns are due to problems which can be avoided and likely to be picked up by a Vehicle Health Check. Our expert technicians will check the tyre tread depth and pressure on all the tyres (including the spare if access is available), where necessary, the pressure is adjusted. Tyres are also inspected for any visible damage. A visual inspection of the exhaust and its mountings is carried out to check for physical damage, leaking joints and corrosion. Where fitted, the physical condition of the catalytic converter is also checked. We will check the level of charge of your battery using our battery testing equipment and also visually inspect the battery (without removing it) for obvious damage. We also check your front and rear wiper blades and your lights to ensure that they are functioning correctly. 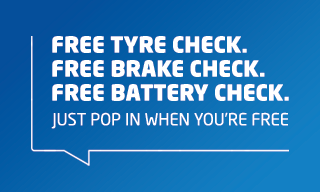 If you don't have time for a full Vehicle Health Check, why not pop in for a Free Tyre Safety Check. We'll check and adjust your tyre pressure, check your tyre condition and tread depths.